Many Absintheurs have asked us which Absinthe brand is the strongest and which bottle has the highest level of thujone. And we are often asked why we do not write the thujone content in mg next to each Absinthe brand. Therefore we decided to upload this website to provide some relevant information in regard of thujone. Absinthe and Thujone doesn't mean that Absinthe is a drug! FACT #1: Absinthe is NOT a drug. It will cause a physical and mental activation but you will not hallucinate. Therefore "Absinthe" will not show up in any drug test. FACT #2: The thujone content in an Absinthe varies from distillation to distillation as it depends on the quality of the herbs used. Not every year the wormwood harvest is the same. Sometimes the weather and other circumstances lead to a higher content of thujon in the wormwood plant. Therefore, as the Absinthe recipe stays the same, it might be that the same recipe with the same amount of wormwood results in an Absinthe with higher thujone. "Exact mg" numbers you might find in the net are just estimations. Do not look too much at them. Also Absinthe producers advertising with "100mg of thujon" are con artists, they just want your money, often these Absinthes contain 0 mg thujone. Avoid to walk into this rip-off trap! FACT #3: Absinthe has much more to offer than the ingredient "thujone". It is a drink of history, pleasure and quality. We will not promote any "thujone super bombs", but as many of our Absintheurs asked us we publish the levels of some Absinthes, where we know the approximate levels based on chemical thujone analysis which were made in the past. These Absinthe bottles can all be bought in our Strong Absinthe section. But do not expect that you will consume a hallucinogenic drug. This is a common misunderstanding about the liquor, Absinthe will not make you hallucinate! If you are interested in more background info about the drink, check out our Absinthe for sale info site. You will find info about the legal status of Absinthe there as well. If you want to drink Absinthe (alternative spelling: Absynthe) you should perform the traditional Absinthe ritual: You have to have an Absinthe spoon an Absinthe glass and sugar cubes. Do not prepare the Green Fairy the "Czech way", meaning setting it on fire. The fire destroys not only your beautiful accessories, but also the fine taste of the Green Fairy. Therefore we recommend to drink the Green Fairy the original French way, where you only add ice cold water and sugar - No Fire! If you prepare the Green Fairy the original way, you need some authentic accessories like an Absinthe Fountain, Absinthe Glass and Spoon for the proper preparation. You can get all of these Absinthe accessories in our online store ALANDIA. You also find videos about the different rituals there. „After some of the reviews I read, I was expecting something gratuitously bitter, but that wasn't the case at all. Maybe you guys tweeked the formula within the past year, but Strong68 tastes amazing, and just like absinthe is supposed to: there is definitely a wormwood \"bite\" at the fore, but the anise is there too, and adds enough balance so that I only needed one sugar cube (if that). This is excellent stuff, with a delicious taste that betrays its 68 abv." „We loved this absinthe (....) I personally enjoy the slightly upped bitterness (not being a person who likes sweets). We found it smooth, nice louche, and we didn't add any sugar cubes." We hope we have helped you to get some clarity about Absinthe & thujone. 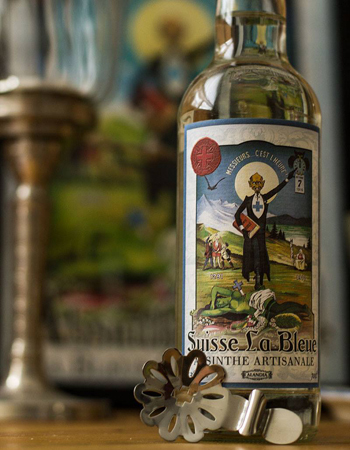 If you like to buy a bottle of Absinthe at our online store but still need a little bit more info about the ordering process, check out our info site: Buy Absinthe in the USA. This page is especially made for US Absintheurs, but the info presented is of course as well valide for our international customers. In case there are still open questions, just write us an email or visit us at Facebook. Cheers and green greetings!